Comprehensive and fully up-to-date, Webster’s New College Dictionary includes the latest vocabulary in science, technology, medicine, contemporary culture, and much more. The definitions are clear and precise, and Feature Notes offer insightful guidance on the vocabulary of American English. This updated edition of the popular family-friendly dictionary, with a fresh and contemporary new look that sets it apart from other Webster’s dictionaries, features more than 250 new words, such as dwarf planet, eyewall, manchego, and puggle. The biographical section has been completely revised to include scores of current political, literary, and scientific figures, such as Tim Berners-Lee, Jhumpa Lahiri, and Nicolas Sarkozy. 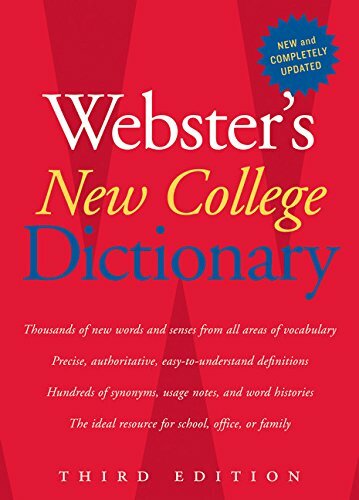 Created to serve the needs of a wide range of users, including students on campus and families at home, Webster’s New College Dictionary has hundreds of notes on usage, word histories, and synonyms that shed light on our language and offer guidance on word choice. Authoritative and easy to use, this resource is a trusted companion to inquisitive minds at every stage of life. If you have any questions about this product by Houghton Mifflin, contact us by completing and submitting the form below. If you are looking for a specif part number, please include it with your message.